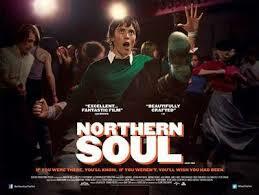 Northern Soul: The Film & Keepin’ The Faith. At long last, today – October 17th, Elaine Constantine’s much anticipated film Northern Soul hits the big screen at 120+ cinemas around the country and the buzz just keeps on keeping on. There’s been a spate of pieces in The Guardian over the past 12 months (including an interview with Elaine and a piece “How to dance to northern soul” by Tim Jonze) and with the film’s imminent arrival features have inevitably appeared in other national dailies. The Beeb’s Culture Show featured journalist Paul Mason documentary Keeping The Faith – a reflection on his youth at Wigan Casino and “a music scene that has refused to die”. Last weekend Gilles Peterson dropped a Northern Soul special on BBC6 and interviewed both Elaine and her partner Marco Santucci while over on Mi Soul my good friend Ross Allen was diggin’ into the double cd on Harmless that’s been compiled to go with the film. My younger brother has had the film on pre-order at Amazon for months and I’ve been busy trying to lock down an ace spinner from the Northern scene to help him hone his spin skills to the level of a kid with glasses that he spotted in one the Northern Soul trailers or a “making of..” shorts. He’s a refined northern soul dancer – having honed his skills over four decades but that tight multiple northern spin can be bloody elusive. As it goes, it was my brother who turned me onto the music that was being played at the Twisted Wheel. I was 18 and doing foundation at Rochdale College of Art. My friends were bikers, hippies – regulars at the Magic Village who drank in The Crown – the only pub in Manchester that served people with long hair and had a superbly stocked Juke box (whoah, just had little memory flash of Albert King’s ‘Cold Feet’). I collected records but it was Captain Beefheart, Love, Van Morrison, Bob Dylan, Mothers of Invention, Velvet Underground, Howling Wolf, Roland Kirk. 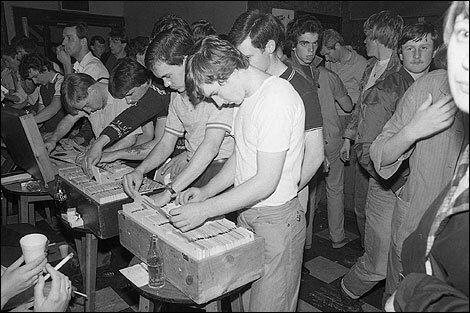 We were both at school with Richard Searling – who is today one of the most celebrated Northern DJs. He was the first kid I’d seen with cropped hair and matching wrangler jacket and jeans. My brother, along with a close mate who’d become a Wheel regular and was probably robbing chemist shops, was fixated on being a mod. That said, we lived in mill town outside of Manchester and there was no money in our house for Levis or Ben Shermans or a made to measure blazer. You had to have left school and be earning to even think about style. I finished at Rochdale in the summer of 1970 and after doing a couple of months of shift work in a local paper mill spent a portion of my money on a new look that I was to take with me to art school in leafy, conservative Cheltenham. A leather coat, a pair of plain Royals, tonic mohair trousers, 501s, DMs,a Harrington, couple of button downs and a bottle of Brut! I also carried a little record box of sevens – Earl Van Dyke, Fascinations, Al Wilson, Archie Bell, The Dells, The Contours, Jackie Wilson, Gladys Knight,The Elgins… which accompanied the rest of my record collection. The Twisted Wheel closed in early 1971 leaving the Wheel regulars to roam the nation in search and next all nighter. Cheltenham, had a long-time rep as a mod town, and I quickly discovered a pub that was frequented by a posse of Wheel regulars. Being dressed appropriately as well as having a solid command of the dance moves I was welcomed into the firm. It allowed me to dip out of the art school world and reconnect with a dressed and pressed, soul music loving crew of working class geezers who thought nothing of driving up to the Catacombs in Wolverhampton and then when it closed around 1am heading off through misty countryside to find an all nighter in a church hall in Market Harborough. Good times. 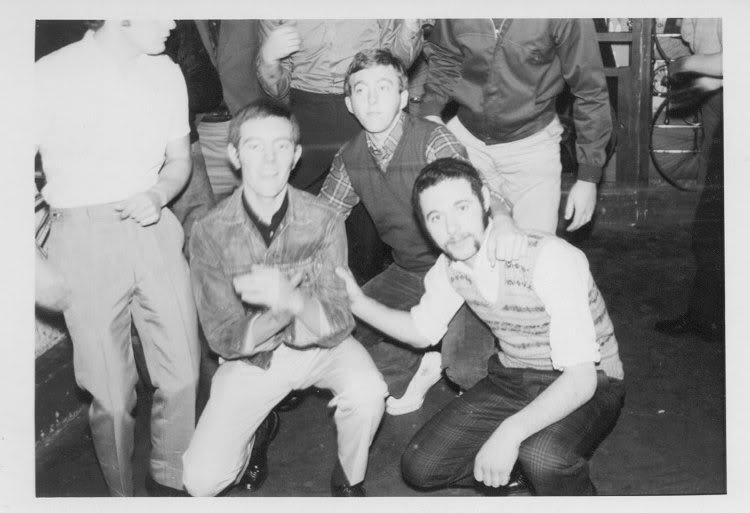 Meanwhile, back in Manchester my brother was checkin’ out the Torch in Stoke, which opened in ’71 following the demise of the Wheel, and also the very excellent and progressive Highland Room in Blackpool Mecca which was deejayed by Ian Levine and Colin Curtis. He has good memories of Wigan but by the time it opened its doors in September in 1973 I wasn’t really down with what it had to offer. In 1974 I moved to east London. I’d become heavily involved in politics and the combination of the music and the message was paramount. The Northern scene originally resonated with the rise of the Black Power movement. The leather driving gloves and clenched fist salute was pure Tommy Smith at the Olympics. However, by ’74 you’d had radical offerings from Curtis Mayfield, Stevie Wonder, Marvin Gaye, Donny Hathaway, Gil Scott Heron, Parliament and jazz-men like Archie Shepp. The Godfather – James Brown – had ushered in the Funk while Black America was ragin’. There was a musical renaissance taking place in Black America and it was largely being ignored by the Northern scene. In Britain in 1974, we were being subjected to an IRA bombing campaign, the National Front and racism was on the rise and the nation was on a three day week in response to a miners strike. The streets of London were piled high with garbage. 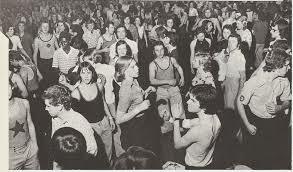 Tough times were ahead for the working class youth in the soon to decimated north of England and appropriately 1974 – that first ecstatic year at Wigan Casino – provides the setting for Elaine Constantine’s Northern Soul. It seems like age has passed since I came across an initial interview with Elaine about the film she was making and I loved the inspirational story of being at a school or youth club dance in Bury and suddenly, on the arrival of a certain tune, she witnessed a posse of awkward teenage lads become transformed as they slid out of the shadows and onto the dancefloor. I have yet to see the film… it’s got to be this week.. and am looking forward to it. However, along with the film I can also heartily recommend the hard-back book – Northern Soul: An Illustrated History – that Elaine and writer Gareth Sweeny have put together. Whether you are from the scene or not I suggest you seek it out. The combination of oics from the 70’s mixed with images from the film can be a touch confusing but it effectively prevents it all from slipping into a retro cul de sac. 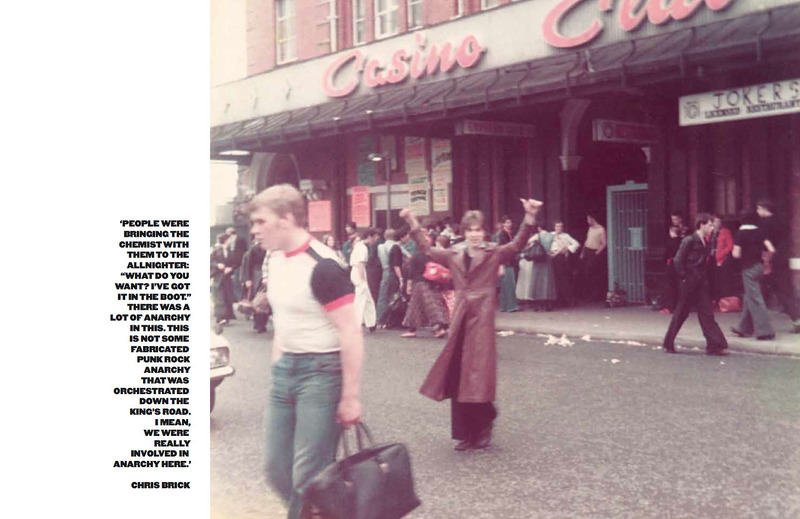 That said, the essential content of this book is a no holds barred people’s history, from the Twisted Wheel to Wigan casino and Blackpool Mecca to the new Millenniunm, built around a collection of personal testimonies from those who were there. The music, the drugs, the rivalries – the life. 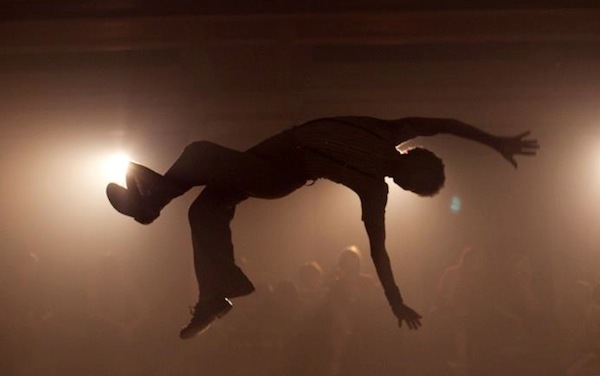 While the Northern scene, like the soul and funk weekenders, continued to thrive despite its ageing following, this film has already provided the springboard for a new generation of dancers – a core group of whom came to the music and the dancing though their acting roles in the film. 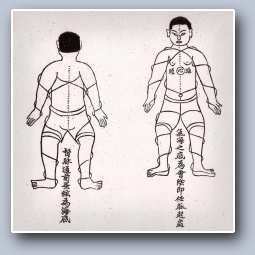 Basically, they got hooked and once hooked there’s no going back. It’s going to be most interesting to see what kind of impact the film has in the near future. 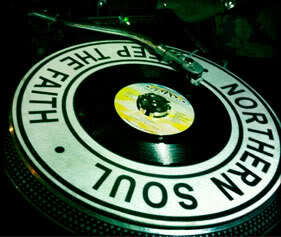 The Northern Soul compilation album (and the package of 7″ singles) available through Harmless record romped into the album charts at number 6 and it appears that a whole new generation of kids might just get tempted by those soulful vocals, that beatin’ rhythm and the trancendental, euphoric potential of those fleet-footed, acrobatic dance moves. All you need is a little faith. 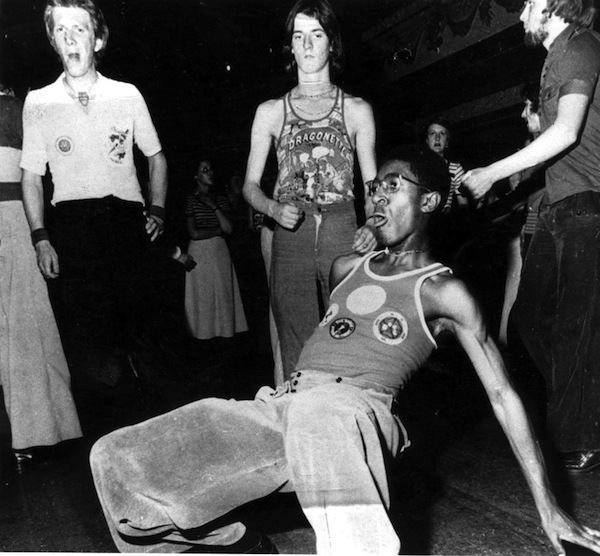 This entry was posted in Urban runnings..., Words, Sound & Power and tagged 1974, Blackpool Mecca, Colin Curtis, dance, Elaine Constantine, Harmless Records, Ian Levine, northern soul, Richard Searling, soul music, The Torch, Twisted Wheel, Wigan Casino. Bookmark the permalink.